I have wondered about my own childhood and the things I remember about my experiences and myself and my family. The stars and the possibilities of life ‘out there’ have always fascinated me. Odd and unusual events and experiences have always peaked my interest. I always took this sort of things as reasonably commonplace. The times my extended family would gather, was a time of stories of the bizarre and unusual. Just about every member of my family would have a collection of stories they could tell about some strange experience they had. So, in light of this I have never felt that I was too terribly strange. The stories would fly about at our gatherings. I come from a long line of wonderful storytellers. My father, grandfather and my uncles could weave their tale and take you to a vivid experience. There was never any doubt in my mind that these stories were true. Oftentimes, there was more than one witness to these events. I would hear of my two brothers tell of watching a fireball act oddly as it coursed across a small ridge in the foothills of California in the 60’s. There are stories of my own now to add of strange sights in the sky. Odd things that go bump in the night are more the common topic with my family. I am going to recount a few stories that I remember to the best of my ability. I will add more as I get together with my sister to verify places and that sort of thing. One story in particular I remember my father telling. We lived for a time in the foothills of California. He had a ranch he rented there. I would go and visit in the summer. The area is full of beautiful homes now, but when he lived there a twisting dirt road and small ranches hidden in the canyon and brush were more the usual. There were times on the darkest nights when those twisting dirt roads had a surreal quality to them. Headlight illumined the start branches of winter, giving them an unearthly ambience. One journey I recall one late night during a particularly heavy fog, was hair-raising to say the least. 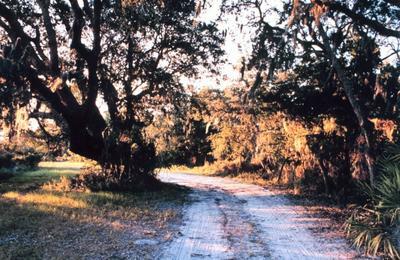 Not being able to see more than three feet ahead on narrow twisting dirt road was no picnic. The road edge was a sheer drop, which added to the less than desirable excitement of the experience. My father would find himself heading home along those lonely roads often at night. I am not sure where he was when this odd experience happened to him. Apparently he was riding home one late night along a stretch of country road He was few and far between any neighborhoods. There would be an occasional home loom out of the darkness along side of the road. He drove along and noticed a particularly old looking farmhouse coming into his view. He noted as he approached that a woman wearing old-fashioned clothes opened the door and threw a pan of water onto the dirt beyond the porch. This was not particularly unusual. Many old places survived the years and many clung to old ways. The road did not have any detours, or side roads going off it as far as I recall in the telling. It is odd, how often times we might see something and not be aware that it was something amazing. In the course of days nothing was thought of the experience. There came another time when he found himself again on that stretch of road. Traveling as he was want in the area for whatever business he had. He fully expected to see the house in the place he had formerly. When he approached that spot he found no house. There were however, the old remnants of a home. It appears it had most likely burned down many years ago. What did my father see? Maybe, we should ask where did my father see? Did he find a window into yesteryear? 6 Feb 2005 @ 13:20 by jstarrs : Strange Stories? I had a book which was like a bible (we were a commie family) called Strange But True (or something like that) and my favorite true story was the housewife up in the north of England who discovered she had a little pot of cumin powder that, no matter how much she used it, it was always the same level! I thought that was so ordinary but fantastic that there had to be a magic side to the world, even if I couldn't see it. Is this intentional? "There would be an occasional home loom out of the darkness along side of the road." If it isn't I think it should be. I look forward to hearing the stories!! I like the unusual stuff also...loooking forward to reading more of your family stories.